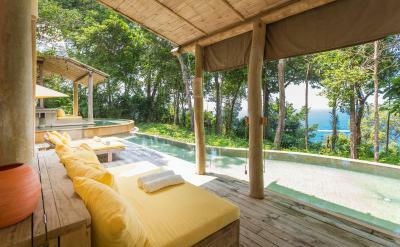 Lock in a great price for Soneva Kiri – rated 8.9 by recent guests! Nestled amid an unspoiled tropical island of Koh Kood, Soneva Kiri offers luxurious villas with a private pool and private terrace. It presents an outdoor pool with sun loungers, a fitness center and on-site dining options. Free Wi-Fi is available throughout the hotel. Air-conditioned villas boast a beautiful décor and offer a fully equipped kitchen with a dining area and a living room with sofa sets. They include a flat-screen cable TV with a DVD player, an iPod docking station and a dressing room. Private bathrooms feature free toiletries, a bathtub and shower facilities. Take a stroll on the private white-sand beach or relax with pampering massage treatments. A variety of other recreation facilities include a tennis court, children playground, a library as well as an open-air cinema. Water sport activities such as snorkeling and canoeing can be enjoyed as well. Guests can sample a variety of authentic Thai cuisine served at The Benz restaurant. Other dining choices include Dining Room and The View, which offers International dishes. 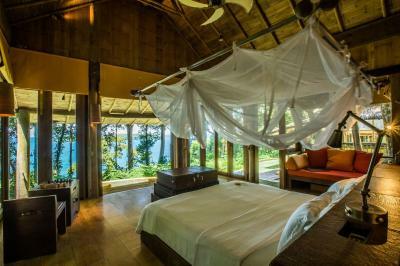 When would you like to stay at Soneva Kiri? Featuring forest views from the bedroom and a private pool, this spacious villa has a separate living room with sofa set, a full kitchen and a dining area. It includes a flat-screen cable TV, a DVD player and an iPod docking station. The private bathroom has free toiletries, a bathtub and shower facilities. Larger than Hill Suite Villa, it features a private terrace and a private pool. A separate living room with a sofa set, a full kitchen and a dining area are available. It includes a flat-screen cable TV, a DVD player and an iPod docking station. The private bathroom has free toiletries, a bathtub and shower facilities. On the beach front, this spacious villa has a separate living room with sofa set, a full kitchen and a dining area. It includes a flat-screen cable TV, a DVD player and an iPod docking station. The private bathroom has free toiletries, a bathtub and shower facilities. Offering an electronic golf cart, this multilevel style villa comes with a spacious living room along with a flat-screen cable TV, a DVD player and an iPod docking station. Its 2 bedrooms features high ceiling and plenty of natural light, as well as pleasant views. This villa also has a dressing room, a dining area and private bathrooms. This villa features a balcony, private pool and seating area. One hour’s flight from Bangkok by private plane but oh so peaceful. Our Thailand resort offers an unrivalled combination of luxury, environmentally friendly design and unforgettable, authentic Thai experiences. Twenty-four of the largest resort villas in the world and eleven private residences, are vast in scale. Located on the idyllic beach or sunny slopes in the rainforest, all have stunning infinity pools, impossibly chic furnishings, personal electric buggies and impeccable service courtesy of Mr./Ms. Friday private butlers. Highlights include the open air Cinema Paradiso, Benz’ mangrove restaurant, the Chocolate and Ice cream parlour, the Observatory, The Den and the spectacular Treetop Dining Pod. Barefoot Intelligent Luxury at its best. No news, no shoes, Thai style. House Rules Soneva Kiri takes special requests – add in the next step! All children under 12 years are charged THB 2000 per night for extra beds. Any additional older children or adults are charged THB 4000 per night for extra beds. Soneva Kiri accepts these cards and reserves the right to temporarily hold an amount prior to arrival. The hotel provides a 70-minute round-trip transfer service from Suvarnabhumi Airport to the resort's private airport island at Koh Mai Si by an eight-seater private plane. After arrival, guests will then be transported on a luxury speed boat to the resort's private jetty on Koh Kood. The check-in counter is located at the Departure Hall, on the 4th floor, Counter No. Row D24. Guests are contacted by the reservations team on confirmation to book the above mentioned shared transfers. • Guests are requested to check in no later than 60 minutes prior to the scheduled departure time. • A luggage restriction for the Soneva Kiri Flights is 20 kg per person including hand luggage and must not exceed this limit. • Flight schedules have limited availability and seats are confirmed on a first come first serve basis. • All flight schedules are subject to change due to weather conditions and flight load. • Flights are inclusive of a personal 'Meet and Greet' service and luggage assistance for guests who arrive by international or domestic flights and connect directly to the Soneva Kiri flight. • For guests who are pregnant, a written certificate of doctor’s approval will be required on flight check in. • Private flights are available upon request and reservations can be made by contacting the resort directly. 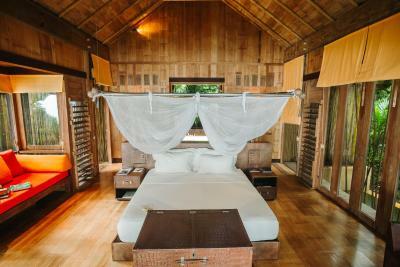 Please inform Soneva Kiri of your expected arrival time in advance. You can use the Special Requests box when booking, or contact the property directly using the contact details in your confirmation.